Why does your coffee taste so good? What do you mean when you say you’re a social business? First and foremost, we are driven by mission, not money. That said, we also believe that a little “adult supervision” never killed anyone. So we’ve become a B Corporation. That means that we’re actually writing into our bylaws provisions to protect all of our stakeholders, not just our shareholders. It also means that we are fully transparent about our social and environmental sustainability. Read more on the B Corporation site. What is good about your coffee bags? Here’s the deal. Our coffee is so freshly-roasted that we package it within an hour of it being roasted and ship it out the same day. So that funny little dot you see about three-quarters of the way up the bag? That’s a one-way valve. It lets off the gases from being so freshly-roasted but keeps the freshness-damaging oxygen out. Why would I want fresh coffee? It tastes better, plain and simple. What am I supposed to do with the coffee grounds after I brew? Coffee grounds are great for compost and even just going straight into the garden. We’ve also heard you can use them as an exfoliator but never been brave enough to try it ourselves. How fast will my order come? We roast and ship out orders on Tuesdays. That means that all orders received before 5pm ET on Monday will be shipped out the next day– people usually get their package within 3-4 business days from then. How high up is your coffee grown? Liga Masiva coffee is grown around 1500 meters. The cooler conditions between 900-2000 meters slow the development of the coffee bean and the end result is delicious. How much of the purchase price goes to the farmers? With conventional coffee, an average of 7% of the coffee’s purchase price actually makes it to the farmers. We aim for 300-400% of that, in addition to our partnership with the farmers long-term community and coffee projects. That’s a huge difference for the farmers… and their families. Why should I care about farmers? What if I am very upset? Oh no! Call us at 1-888-285-1176 or email team@ligamasiva.com and we’ll make it right within 1 business day. Promise. What if I am very happy? That’s great news! 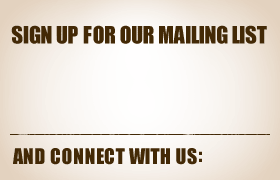 Do us a favor and tell us all about it at 1-888-285-1176 or team@ligamasiva.com. What if I am confused? We’d be glad to help. Reach out to 1-888-285-1176 or team@ligamasiva.com and we’ll help you out within 1 business day. Why is this coffee coming out differently from my old coffee? Because our coffee is so fresh, you won’t notice as many bitter or sour tastes. If you love a strong cup of coffee, it means you can add a little bit more coffee when you brew– you’ll have a fully-developed, well-balanced, super-strong coffee– but with none of the sour bitterness. How long is my coffee good for? Like almost any food product, coffee is best when consumed fresh. For coffee, this means closer to the roast date. Coe, our roaster, has found that Liga Masiva coffee in particular holds its freshness extra long: almost four weeks without much discernible change in flavor. This delicious coffee won’t expire, but take advantage of its freshness within four weeks for maximum flavor. What’s the best way to make iced coffee? Patience! Instead of making our coffee hot and then pouring it over ice, which can leave you with a burnt flavor, we recommend cold-brewing. Place coarsely ground coffee into a pitcher with water (we use 2 ½ quarts water per lb of coffee), making sure all the grounds are wet. Let steep at room temperature for 12 – 24 hours, before straining. This makes a strong coffee concentrate that can last for up to two weeks. How do I know your coffee is really organic? Good question! A few times a year, we visit each farmer and talking about the “latest and greatest” in organic techniques. 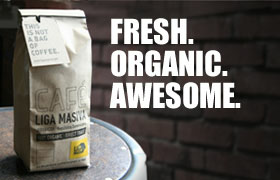 But, in addition to our own experience, our coffee is certified organic by BCS Öko-Garantie GmbH. Each year, they visit some of the farmers that we work with to ensure that they meet USDA organic certification requirements. We get a list each year of the farmers that are certified, which of course includes all our farmer partners. More details here. How should I open the coffee bags? Sometimes people struggle a little bit with the bag opening and we’re creating a new package design so this is as easy as humanly possible. (We’re not in the mood for a struggle before we’ve had our coffee.) In the meantime, you’ll notice we’re now sealing bags at the tip-top of the bag, which leaves an inch between the seal and the metal tie. Go ahead and snip the entire top of the bag off with a pair of scissors, between the seal and the metal tie. Then, once you scooped our your beans, you can just re-bind it closed with the metal tie.